Over the last 40 years, product Legislation within the EU has come a long way since the ‘Old Approach’ in which national authorities drew up technical legislation, going into great detail. In order to address the problems with the often ‘unwieldy’ legislation produced by the national authorities, the ‘New Approach’ framework was introduced in 1987. This framework aimed to restrict the content of legislation to ‘essential requirements’ leaving technical details to European Harmonised Standards. Whilst a significant improvement was made with the ‘New Approach’ framework, it was decided that the framework did not create the necessary level of trust between Member States to allow authorities to accept products they could not vouch for. As such in 1989 & 1990 the Council adopted a Resolution on the Global Approach and Decision 90/683/EEC which laid down the general guidelines and detailed procedures for conformity assessment. Based on these frameworks, 27 directives where produced whose scopes collectively covered a wide range of industrial and commercial products. o CE marking and market surveillance (including revision of the safeguard clause procedures). o Regulation (EC) No 764/2008 to strengthen the internal market for a wide range of other products not subject to EU harmonisation. Of these three measures, the one which is likely to affect the majority of manufactures significantly is Decision 768/2008/EC, the provisions of which will be incorporated in existing Directives as and when they are revised and is in effect, the template for future product harmonisation legislation. 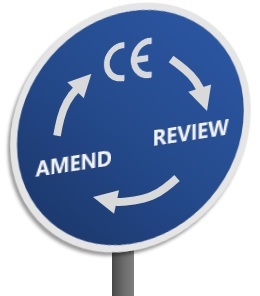 The consequence is that existing CE Marking Directives are currently being reviewed and revised, which means that manufacturers will need to review their existing level of conformity and ensure that they are prepared for the forthcoming changes in CE marking. 1. Directive 2013/29/EU – Pyrotechnic Articles Directive (The Pyrotechnic Articles Directive was adopted in in June 2013 and the requirements of which will be applicable from 1st July 2015). If you are interesting in finding out more information about the updated Directives, including any changes and how these may affect you then please call us on 01564 792349.